The latest Music Hack Day, held in France during the Midem music festival this past weekend, produced a bounty of oddball musical creations. In part one of this roundup, we told you about robot dance fights, a hangman-style lyrics quiz that pays out in free music, and a smartphone app that helps you fake being a fan of any band your significant other might have dragged you to see. The muTrumps musical card game, currently played on two iPhones with other platforms possibly coming later, players start with a set of artist cards from their Last.fm profiles. Each card contains information about the artist in four areas: familiarity and “hottness” (from The Echo Nest, see disclosure below), and the number of album and single releases (from MusicBrainz). After two cards are dealt, the first player decides which attribute to play. The artist card with the highest rating for the selected attribute wins that round, and play moves on from there. Impressively, during each round, muTrumps (sometimes spelled µTrumps) generates a mash-up of the two songs automatically, in real time, and plays it to both contestants. Sometimes it’s hard to believe they build this stuff in under 24 hours. In the olden days, after music fans walked uphill to and from school holding hot potatoes both to ward off frostbite and with which to feed the packs of savage dinosaurs that ravaged the land, they would look forward to Tuesday, when all of the new music for the week went on sale at the local record store. (These were like a combination of iTunes and a music blog, but with a really limited selection and a more tactile interface). These days, says OutNow creator and product innovation manager at Universal Music Group Martyn Davies, record labels have shifted towards releasing singles on the same day they are made available to radio stations, which may or may not be Tuesday. What is a cutting edge music fan to do? OutNow (public release coming soon) ingests a large quantity of musical data each week — release data from 7digital and iTunes, album art from Amazon, artist biographies, unique identifiers and “hype comparison” from The Echo Nest, buy links to 7digital and iTunes, concert information from Last.fm and Songkick, and audio clips from 7digital — and mashes all of that into a one-stop shop where music fans can find out what’s just been released, who made it, what it sounds like, and where to buy it. All you need now is a snarky record store clerk to make fun of your decisions. Somewhere out there sits multi-instrumentalist recording and performing artist Imogen Heap. Your mission, should you choose to accept it, is to find her, but not with a fingerprint duster, magnifying glass, or other traditional tools of the gumshoe trade. Instead, you must find your way to her through the world of music. Select a difficulty level, and Six Clicks to Imogen selects an artist — Bruce Springsteen, in the video example above — as well as four artists that recorded with Bruce. Each time you select an artist, Six Clicks presents you with four more artists. Much as players of Six Degrees of Kevin Bacon try to pick actors and directors to connect a seemingly unrelated person to Bacon, the goal here is to track down Imogen Heap based on who she recorded with, who they recorded with, and so on, with that information coming from MusicBrainz and The Echo Nest. If you make it to Imogen in six clicks, you win — and may have even learned something along the way. 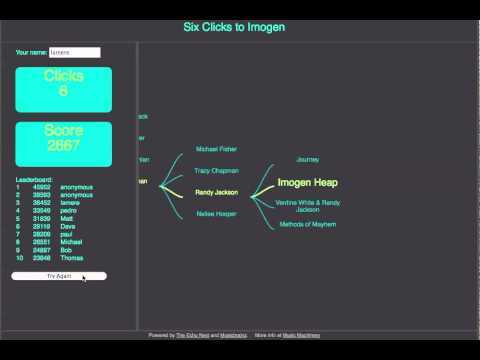 Update: Conversely, Imogen Heap has found her way to Six Clicks to Imogen. Sheet Music SoundCloud Recorder lacks screenshots at this stage, but this is what MuseScore's sheet music looks like on its website. This iPad app, which creator Nicolas Froment of the sheet music service MuseScore says will be available in the iTunes app store soon, essentially bridges the gap between sheet music and your recorded version of it. 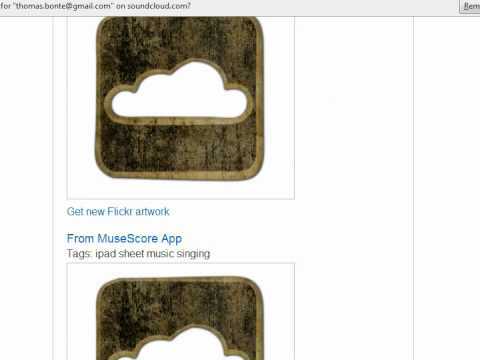 The Sheet Music SoundCloud Recorder app (no screenshot; desktop version of MuseScore pictured above) gives you access to sheet music that has been created or notated by MuseScore users, after which your task is to sing that music or play it on the instrument of your choice. The app automatically uploads your rendition to SoundCloud, creating a record of your playing, singing and rehearsing, which you can either make public or allow only certain users to see. The app has many potential applications, perhaps chiefly among them, giving music teachers an easy way to monitor their pupils’ progress. Personally, I’m glad this sort of thing wasn’t around back when I was shirking my piano practicing responsibilities — although if it had been, I’d be a better player today. You’ve just put the finishing touches on your latest recording, and now, it’s time to share it with anyone who cares — friends, old bandmates, that scruffy guy at the label, or total strangers, as the case may be. These days, musicians tend to use SoundCloud for this part of the process, and like other methods of music distribution, SoundCloud enables you to include an image along with your song. Sure, you could just head to Flickr and choose the first image that looks right — and this tool allows you to do that too — but why not try to convey something about the music itself, in a real, scientific sense? SoundCloud Artwork Maker (more info) runs your song through a number of analysis tools from The Echo Nest’s API to understand the song based on several attributes, and uses them to create an original piece of artwork that conveys audio information visually. Disclosure: These apps use a mix of APIs (Application Programming Interfaces) from 7digital, Flickr, Last.fm, MuseScore, MusicBrainz, MusiXmatch, SongKick, SoundCloud, The Echo Nest and others. The Echo Nest publishes Evolver.fm.